Andrika has a comfortable bed, a bathroom with a bidet and a shower, a kitchen and plenty of open space. TV and radio. Nespresso coffee machine (capsules not included), and a range of other small appliances. The house offers convenient amenities such as private access to the sea (see photos). The property is located in a sunny place and offers peace of mind. Punta Campanella: The attraction of the house overlooking the Marina Lobra, in the fantastic setting of the protected marine reserve. This beautiful natural setting offers views and breathtaking sunsets over the islands of Ischia and Procida, the Vesuvius and the rock Vervece. A few meters from the residence lies the charming marina Massalubrense (Marina Lobra), where you can book a boat to Capri, Amalfi and Positano, enjoy the culinary delights of Sorrento and enjoy the pleasant atmosphere of the fishing village. Diving center, disco bar, and nearby restaurants in the month of July and August. Massalubrense is within a few kilometers of Sorrento, Amalfi and Positano, a few kilometers to Capri, Ischia and to Procida easily reached by hydrofoil from Sorrento. Pompeii, Herculaneum and Vesuvius are suggestive and connected with the Circumvesuviana train from Sorrento. Access to the property is via private stairs from the public way. No pets allowed. Municipal road and is on charge. BY CAR: Motorway A3 exit Castellammare di Stabia, go to Sorrento and then to Massalubrense. From Massalubrense head to the port of Marina Lobra. Sita bus or Eav) to Massalubrense center and then head for the port of Marina Lobra. IF YOU LIKE TRAVELLING WITH A COUPLE OF FRIENDS, WE CAN OFFER YOU ANOTHER FLAT IN THE SAME PROPERTY "THE HOUSE" (see on the site). We had a wonderful stay in Massa Lubrense. Fair warning, if you are not able bodied, this is not a stop for you as there are many stairs. The owners were very friendly and the fishing village charming. We spent two wonderful weeks at Andrika house where we were able to relax straight away. The apartment although small had everything you needed and was spotlessly clean. We had the roof terrace which is where we spent a lot of the time during the day with amazing views over the sea and often finished our evening there too. Tiziana and her family made us feel very welcome and nothing was to much trouble. Andrika house makes a perfect base for visiting the sites on the Amalfi coast and also the island of Capri which is a 40 minute boat trip which can be boarded at Massa lubrense harbour. We would definitely recommend this apartment and we are looking forward to returning. Gorgeous views and wonderful hosts! Both Tiziana and Ciro were lovely owners who showed us around and gladly provided extra special touches unlike any other place we stayed in Italy. When we arrived, it was late and hard to get dinner - they cooked us a beautiful Italian meal and were always offering to give us a ride. The patio pictures don’t do this place justice as they are phenomenal! We highly recommend staying here for a relaxing, scenic getaway. Beautiful views and wonderful hosts! We had a wonderful time!! The place was beautiful and we had wonderful and helpful hosts! I would highly recommend. We would stay here again. And must go to Angelo's snack bar!!!! Delicious food and warming atmosphere ran by the whole family. Lovely and clean property, lots of stairs good workout, apartment very nice and clean and welcoming. Ciro and Tiziana were excellent in making me feel welcome, very helpful and generous with their time. Nice basket of fruit and sparkling wine at my arrival. The apartment was close to the town, walk or local bus. Many boat excursions directly from the wharf. Will certainly go back, absolutely loved it. 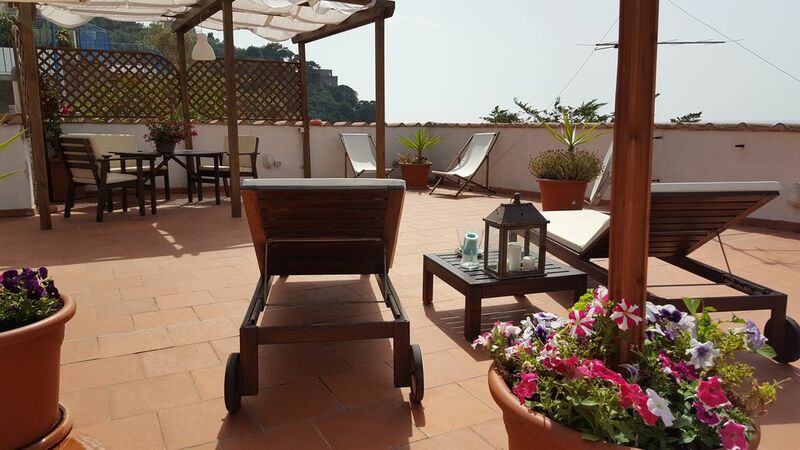 Compact but well appointed apartment in a great location with easy access to local marina, with boats to Capri and Amalfi Coast, a lovely bar and good restaurants. A few minutes drive to Masse Lubrense and 10/15 minutes drive from Sorrento so easy to access without the crowds of that tourist centre. Minor disdvantages are the number of steps to access property and the sea (but that is a consequence of its attractive hillside location) and could do with more shade (additional umbrella required) on the terrace in view of the strength of the sun in high summer months.